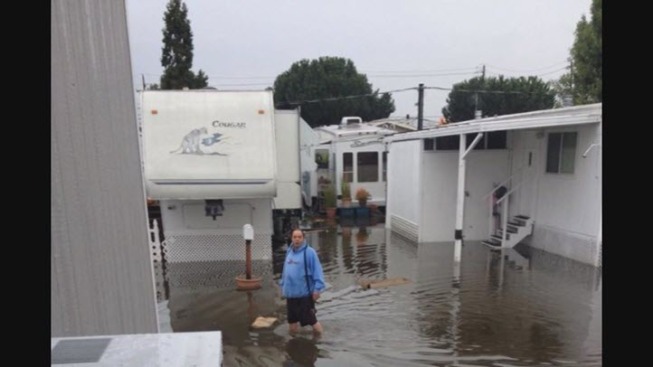 Lawyers say Caltrans did not properly maintain the drainage system, which prompted flooding at the trailer park. The owner of a mobile home park in the Peninsula is blaming Caltrans for a flood last winter and is worried it could happen again. Bryn Walmisley and his neighbors at the Belmont trailer park had to be evacuated from their homes after a storm in December 2014. "My cat disappeared and hasn't been back since that day," Wlmisley said. Residents were knee deep in water and many of the homes at the trailer park were damaged. "We're really just looking for damages, for the expenses that the mobile home park had to pay," attorney Marc Bender said. Bender and his firm have filed a lawsuit against Caltrans, the City of Belmont and San Mateo County. The lawyer said Caltrans did not properly maintain the drainage system, which he says is the reason the park flooded. "There was no mechanism to pump it out or anything like that," Bender said. Lawyers said the lawsuit was filed after the property owner's $214,000 reimbursement claim was denied by Caltrans. The trailer park is located in unincorporated San Mateo County. Belmont's city attorney said they are not at fault or responsible for the flooding. Caltrans said it cannot comment on pending litigation. Calls to San Mateo County seeking comment on the lawsuit were not returned Friday. "San Mateo County cares about these residents and was quick to provide aid and shelter after the major storms inflicted damage on them and their property. However, the ownership, control and maintenance of the unmaintained drainage pipe that caused the flooding, is the sole legal responsibility of Caltrans. The lawsuit by the park owners against the County is therefore misplaced and we will be seeking an immediate dismissal."